by Dave from The Longest Way Home ~ August 14th, 2013. Updated on July 16th, 2018. Published in: Travel blog » Food around the world » Nepali food. I’ve covered just about every typical momo variation I can think of here. From tourist momo’s in Nepal, to local momos and fried momos. This is the last of the great momo posts. And it’s one of the uncovered great ones. Momo soup is not all that well-known. Which is a shame as momo soup is delicious! Take a look at the tourist momo link above for some detailed momo analysis. Meanwhile think of a momo as a small bite sized steamed dumpling with a filling. Either buff (buffalo), chicken, cheese or vegetable. Now for the soup part. Add your standard vegetable stock into a bowl along with hefty chunks of fresh spinach leaves along with cabbage, onion and carrot. A dash of pepper and chili then follow-up with some steamed momo of your choosing. The result? Softy meaty noodle like soup. But with momo’s instead of noodles of course! What does momo soup taste like? Peppery with soft succulent momos floating around in among some crunchy fresh vegetables. It’s really pretty good. A little peppery in many of the places I’ve tried it so be warned and try it before adding anything into it. 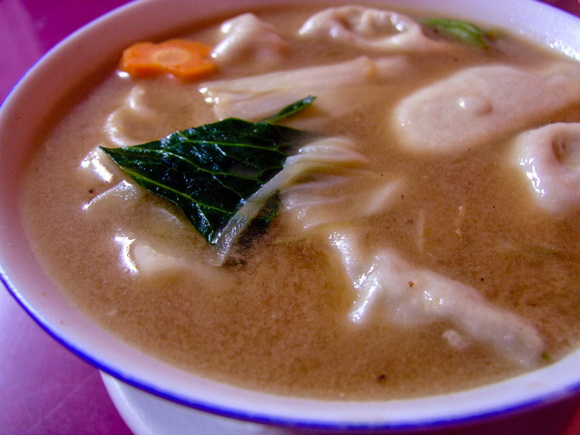 I’ve tried many soups in Nepal including thunkpa (a thick Tibetan noodle soup). Momo soup comes out on top. You do however need to find a good dedicated momo restaurant though as the cheaper one’s are simply broth and the momos are falling apart inside. Try my travel guide to Thamel in Kathmandu for some recommendations on places to eat. Find a good momo restaurant and enjoy this excellent momo soup! Looks yummy. They have this is Tibet too. Can’t remember the name but it’s really filling. Thunkpa is the closest Tibetan soup I can think of! Dumplings in a Soup so simple but I’ve never seen or thought about it before! I think this is the only place I’ve seen dumplings in a soup too! Looks thick and warm for winter. What’s inside the vegetarian option? Delicious looking. Always nice to see fresh green veg in a bowl of soup! That’s pretty much what I thought too! Momo’s are simply delicious. Mix them with soup and I think you’ve got all your bases covered Dave!!! Yep, it’s really quite filling. Didn’t see any on treks though! Looks delicious any recommendations on where the best momo soup is?